This section covered a wide range of services which are provided in the village, such as pavement cleaning and refuse collection. A lot of people are far from happy with certain aspects of the services provided. Only refuse collection and recycling facilities are felt to be good, with road maintenance, road cleaning, pavement maintenance and street lighting classed as reasonable. All the other services were regarded as poor. 1. What is your opinion of the following services in the village? The questionnaire also asked residents what other services they feel the village needs. The main responses were based around the subject of recycling and many people requested blue recycle bins. A wider range of recycling facilities was also requested with clothing and plastic being materials that they would like to see being dealt with. 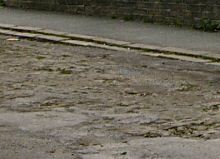 Pavement cleaning was another area of concern and people would like to see them cleaned more often. More litter bins and dog fouling bins are wanted around the village with the ones we do have being emptied more regularly. There is a strong request for fines and penalties for dropping litter and dog fouling. Many people commented on dangerous unmade roads. It was noted that there are no toilet facilities in the village when the park closes early during the winter months. A supply of water to the allotments was called for. Several people feel a stronger Police and Dog Warden presence in the community would be a huge benefit. Further requests include a cash point, more seating in the village, more shops, bus timetables at the bus stops and more lighting along Sutton Lane.